If you’ve never used Crazy Color® before check out these step by step guides on using our most popular products. From how to apply Crazy Color® to how to keep it looking great. Click here for our how-to guide on applying Crazy Color to achieve the best and most vibrant results. Works best with pre-bleached platinum to medium blonde hair. 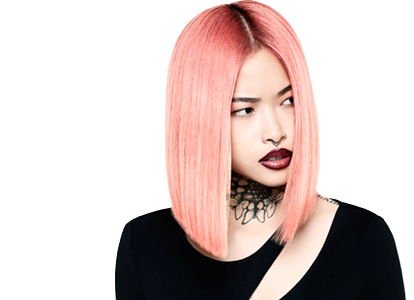 Click here for a step by step guide to achieving a temporary pastel hue. Simply Spray in, blow dry and go. Crazy Color® Vibrant Shampoo is designed to maintain vibrant hair color and is the perfect partner to Crazy Color® semi-permanent hair color cream. Salt and Sulphate free formula is free of the harmful chemicals to ensure the healthiest results after every wash. Available in 4 vibrant shades, which means your chosen color match can be used across any shade of red, blue, pink and purple Crazy Color® shades. Helps to preserve the vibrancy of Crazy Color® with a hydrating formula which leaves strands clean without stripping away your color. 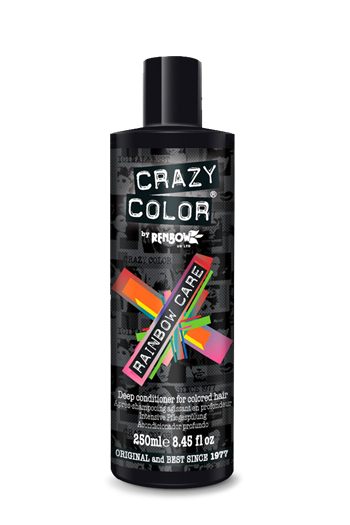 New Crazy Color® Rainbow Care is a deep conditioner to help maintain the strength, shine and suppleness of bleached and colored hair. Infused with a unique protein blend, this formula works wonders on chemically damaged hair while gently removing any product build-up. Contains vitamin rich Sunflower Seed Oil and nourishing Brazil Nut Oil. Frequent use will help to seal and smooth the hair shaft for optimum color vibrancy. Salt and Sulphate free formula. As well as using the Crazy Color® Care range we also advise that you follow a few tips along the way that may just surprise you - some of them won't even cost a penny! Wash hair with cold water, as cold as you can take cold water keeps the hair cuticles closed and stops your color running out. Warm water is the enemy! Shampoo as little as possible. Semi-permanents will lose colour after each wash so avoid over-washing hair. Dry shampoo is your new bestie, bed head and grungy always gets a thumbs up from us. No sunbathing. Too much direct sunlight will strip all that Crazy Color® right out. Avoid swimming. Chlorine is another nasty product that will strip the life and color from your lovely hair so AVOID. High Heat Styling. Put down the straighteners try not to use high heat styling if possible. Use a styling tool with heat control and go down low! Also look up some no heat styling tips for longest results. If you've changed your fickle mind and want another colour faster than it fades or if you've had a disaster (it can happen) we have a few tips that we've learnt over the years. Wash your hair as much as possible. Each wash will begin the colour fading process and the more you do it, the more it will fade. Ditch your regular shampoo. Use anti- dandruff or clarifying shampoo or shampoos for greasy hair -not shampoos for dry, damaged or coloured hair. Hot water opens the hair follicles and is guaranteed to speed up the fading process. The salon. Or finally, the sensible option - go to a hairdresser who can professionally remove the unwanted colour. If you have been left with some unwanted embarrassing stain's we have a few tips to remove them quick! Luckily enough you will have most of them in your cupboard. Alcohol. Dab a bit of the pure stuff on a piece of cotton wool and rub around the hairline or hands. (over 18s only). Toothpaste is a handy one. Make it into a paste using soap and water - use a cotton bud around the hairline. Bicarbonate of soda. Apply a solution to the stained skin and rub gently. Use tips with caution. Be very careful when using any harmful products near sensitive areas and especially the eyes. Firstly, clean a small area of skin for testing, some people often do it in the inside of the arm or behind the ears as these areas are relatively discreet. Squeeze a small drop of dye onto the cleaned area and leave it on the skin for as long as possible – we recommend 48 hours! If no reaction occurs you are good to go and can crazy colour until you heart is content! Enjoy! Rubber gloves are a must! Crazy Color® dyes may only be semi-permanent but don't let that fool you! If you get dye on your skin it will stain, and nobody wants their hands to be the same color as their hot new hair so BEWARE! Safety first, okay, so you have 2 options for testing. Let the dye soak in for approx 15 minutes (ps. if your hair is thick or coarse you may benefit from leaving it on for around 30 minutes) before thoroughly rinsing the sample to reveal your electrifying new colour. Remember it can take up to 24 hours for any allergic reactions to surface. If you experience no reactions you are free to go crazy and color! 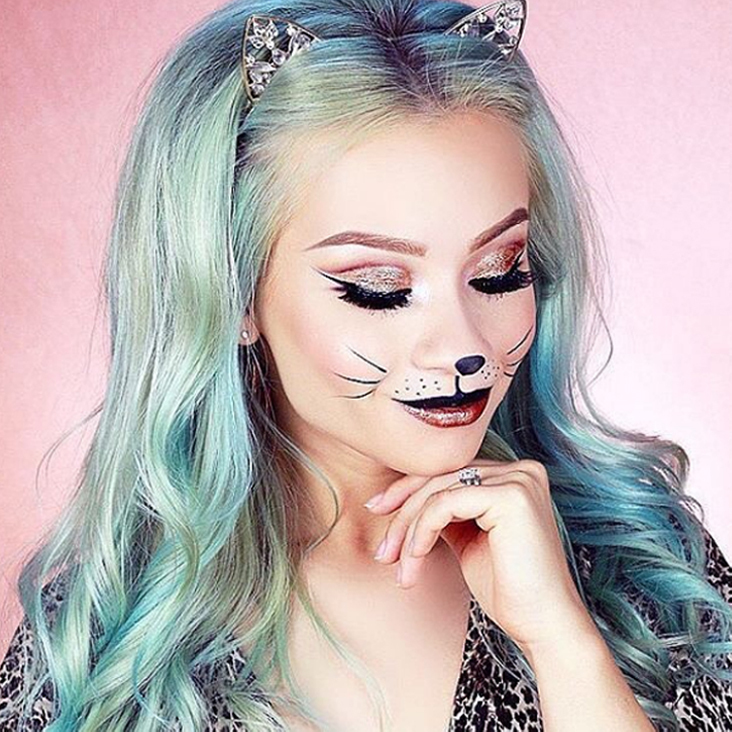 Oh and remember if you are feeling really daring why don't you try mixing our colours to create a devilish shade unique to you! Top tips and answers to our most frequently asked questions. Is Crazy Color® vegan friendly and cruelty free? At Crazy Color®, we understand that our customers want to make ethical and informed choices. Crazy Color® is cruelty-free which means none of our products have been tested on animals. 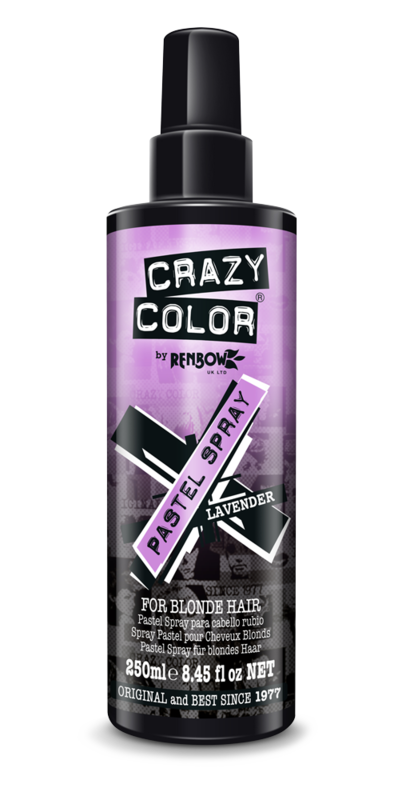 Crazy Color® is also free from any animal ingredient or animal derived ingredients which makes it vegan friendly. Do I have to have to perform a strand test before using Crazy Color® products? It is advised to strand test before using any Crazy Color® Semi Permanent Hair Color Creams and the Crazy Color® Bleaching Kit. Find a step by step for strand testing your hair here. How do I check if I am allergic to the products? Crazy Color® is PPD free, and made with a gentle plant based formulation so we don’t often find our clients having adverse reactions. However you should always perform a patch test with any new hair products being introduced from the Semi Permanent Colors to the Shampoo’s. Find a step by step guide to patch testing here. Do I have to pre-lighten my hair? I dyed my hair purple using one of the Crazy Color® shades, and now my hair has faded out to blue how to I get rid of the blue? Basic color theory will show that a blue base is needed to make a purple shade, the blue undertone in any purple shade is the last to fade out. This kind of color needs to be topped up every couple of weeks to stop the fade. Make sure you aren’t using a hair care routine that strips out your color, see more information here. If the issue is the color blue staying in the hair when you want it removed you should use a sachet of Crazy Color® Back to Base Remover. This will remove any unwanted color and take the hair back to shade it was pre-lightened to. If the issue is the color blue staying in the hair when you want it removed you should use a clarifying shampoo with warm water this will fade it to a pastel blue quickly. You should then let the color fade naturally or consult a hair stylist to remove it. You can also at this stage add a pink or red Crazy Color® over the pale blue to neutralize the tone leaving you with a whole new color!